Just want to let you know that this Vegan French Onion Dip is part of a Silk campaign with Meatless Monday. All views and opinions are my own and are not influenced in any way by WhiteWave or Silk. Vegan French Onion Dip w/ Dill – the perfect thing to cure your munchies! Pair it with chips, crackers or raw vegetables. Made with whole food ingredients and two whole onions! These days my salty crunchy addiction is tortilla chips and salsa. There was a time, though, when my salty crunchy addiction was potato chips and french onion dip. The kind of french onion dip that came from the store, was heavily processed, contained mostly dairy, fat and chemicals and very little to no real onion. Gosh, that stuff was good! But, as you probably already know and from my description right there, it’s loaded with junk. So, I decided to create my own version of french onion dip. And then I added dill because dill dip was also one of my favorites. Two favorites in one, can’t go wrong! Voila, Vegan French Onion Dip with Dill. Perfect for game day or just to cure the munchies. This vegan french onion dip uses cashews to make it creamy, lemon juice and apple cider vinegar to make it tangy and 2 whole onions because, well, it’s ONION dip! You definitely won’t find that many onions in the store bought kind….if you even find any at all. 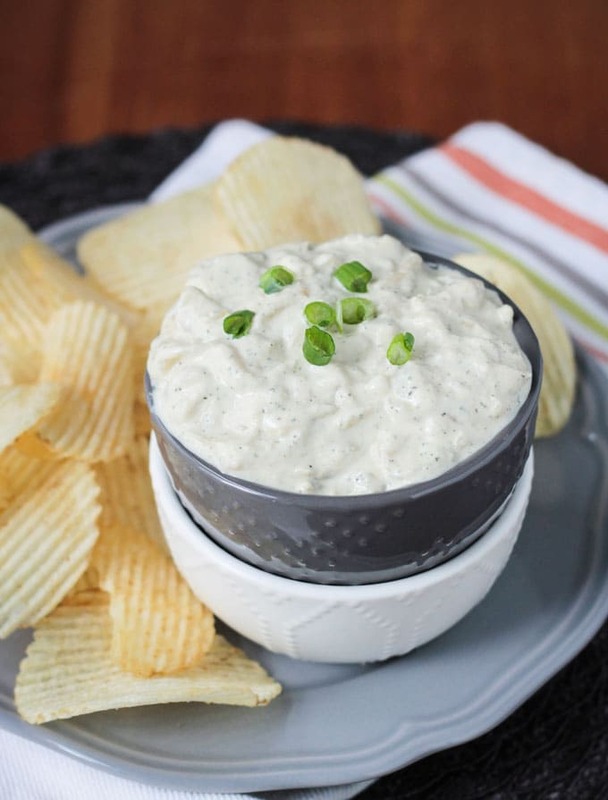 It’s the perfect sweet, tangy, creamy dip to pair with crunchy, salty potato chips. But, I don’t suggest you eat potato chips all the time, so it would work perfect with raw veggies, pita chips or crackers as well. Or even as a spread on a sandwich or in a wrap! You guys, I have a serious addiction to dips, sauces and spreads! 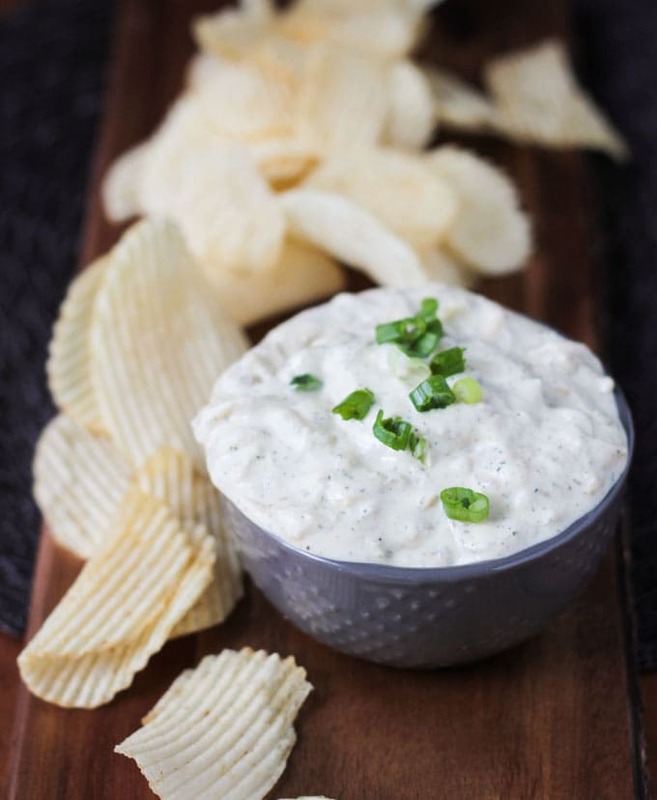 Silk’s campaign with Meatless Monday is encouraging people to “Sideline Meat” on “Meatless Monday Nights.” Since I am always encouraging people to “sideline meat”, it seemed like the perfect time to share this vegan french onion dip. 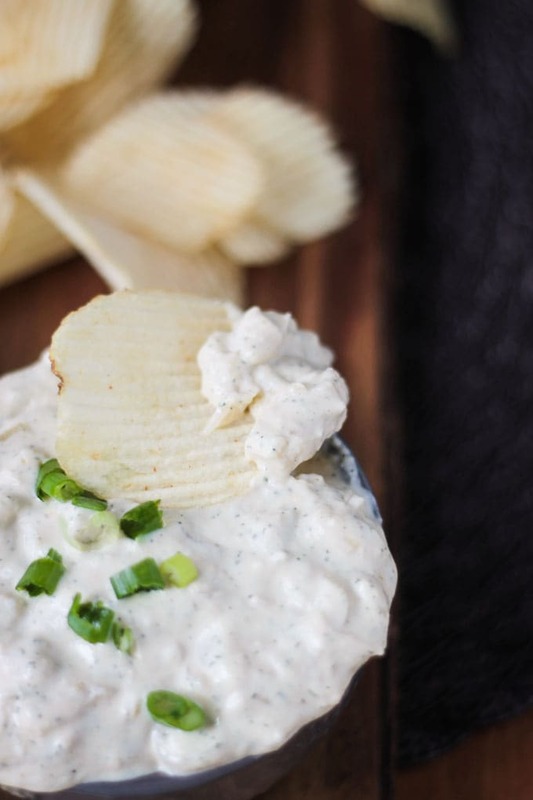 I hope you love this french onion dip recipe as much as we do! If you try it, please come back and leave me a comment below with your feedback and star rating. You can also find me on social media. Be sure to tag @veggie_inspired and #veggieinspired so I’m sure to see it. Enjoy! 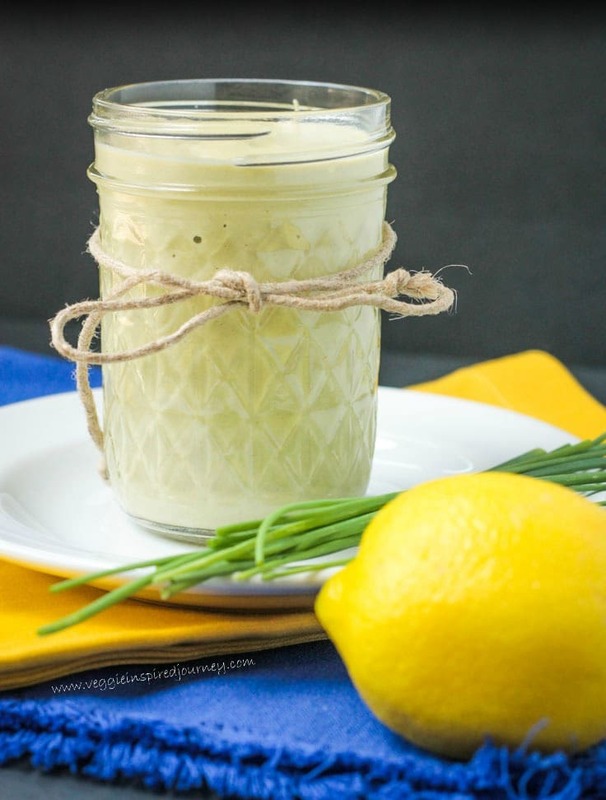 A dairy free, whole foods version of my favorite French Onion Dip and Dill Dip combined. It's, of course, great with potato chips, but raw veggies, pita chips or crackers would be delicious as well! In the bowl of a food processor, place the cashews, vinegar, lemon juice, dill and salt. Process until it starts to come together. Scrape down the sides of the bowl, add 1/4 cup soy milk and process again until smooth, scraping down the sides of the bowl as necessary. If you feel you need additional liquid add more soy milk 1 tbsp at a time. It should be the consistency of loose cream cheese when it's done. *You can slice your onions in long thin strips or dice them smaller. It's really just personal preference. I've made it both way and prefer them in a dice, but both ways are good. **If you are in a hurry and don't have time to soak your cashews, it will still work. Unsoaked cashews will make more of a cashew butter, than cashew cream, so you may need several extra tablespoons of non-dairy milk (or water would work too) to thin it out. ***I have used Silk Unsweetened Original Cashew Milk in this recipe as well. It is also very tasty...a little sweeter than using soy milk. But, any unsweetened non-dairy milk should work in this recipe. We made this for New Years eve gathering and the kids liked it even though it had onions! I used 1 1/2 medium sized sweet onions instead of 2 but I personally thought that many onions made it too sweet. Think I’ll cut onion down to 1 and as others mentioned, boost the garlic and onion powder, possibly more dill. It was easy to make and was nice and creamy like traditional onion dip after refrigeration. Went well with chips and veggies. Glad you all enjoyed it, Emily. Thank you. Happy New Year! I was excited to try this recipe, but super disappointed in the result. I followed the directions exactly. This tastes nothing like French onion dip and is way too sweet. It wasn’t necessarily bad tasting, but definitely not French onion dip. Sorry it wasn’t what you expected, Kim. We love it. Hi Jenn! I just wanted to ask — I noticed that your recipe said that the serving size was 8 1/4 servings. I tend to over complicate things unfortunately, so I just thought I’d shoot you a message 🙂 Is this saying that the total recipe yields 2 full cups of French Onion dip, and that 1/4 cup is 140 calories each? Yes, that’s correct! Cashews are high in calories, but they are also high in nutrients! So glad you liked it! Thank you so much! Hi, Myli. Beans might make it too thick and pasty, but I THINK sunflower seeds would probably work. Soak and grind them just like the cashews. Let me know if you give it a try! Oh my goodness! This dip in amazing!!! I added some extra garlic powder and sprinkled some extra salt for a little extra flavor when I was done making it and it was delicious!!! I’m not a huge fan of the flavor of cashews but with the extra garlic powder and salt I couldn’t even taste the cashews at all! ❤️ Thank you for this wonderful recipe!!! ??☺️? Oh, yeah! Thank you, Leah! So happy to hear this. I’m planning on making it for New Years Eve. Happy Holidays to you! Hi! I have re-read this several times, and I see garlic and onion powder and black pepper in the ingredient list (as well as salt twice), but nowhere in the directions. Do I add these to the blender when I” mixing the cashews, etc? Hi, Jill! So sorry about that – an oversight. I can’t believe no one has mentioned it before this. Thank you for letting me know!! I’ve just updated the recipe, but I add those with my onions to really infuse the flavor. I hope you love it! hi, how long approx do you have to soak the cashews for? Hi, Kendall. A few hours will be fine, but the longer you soak, the smoother it will be. Does this dip keep well? I was thinking of making it a day or two ahead of time for a party, but I know if it would separate like some non-vegan dips do. It will keep for a couple of days. Definitely stir it again before serving, but it didn’t separate for me. It will thicken up more as it sits. If it gets too thick, just add a tbsp or 2 of plant milk and stir until you get the correct consistency. Enjoy! 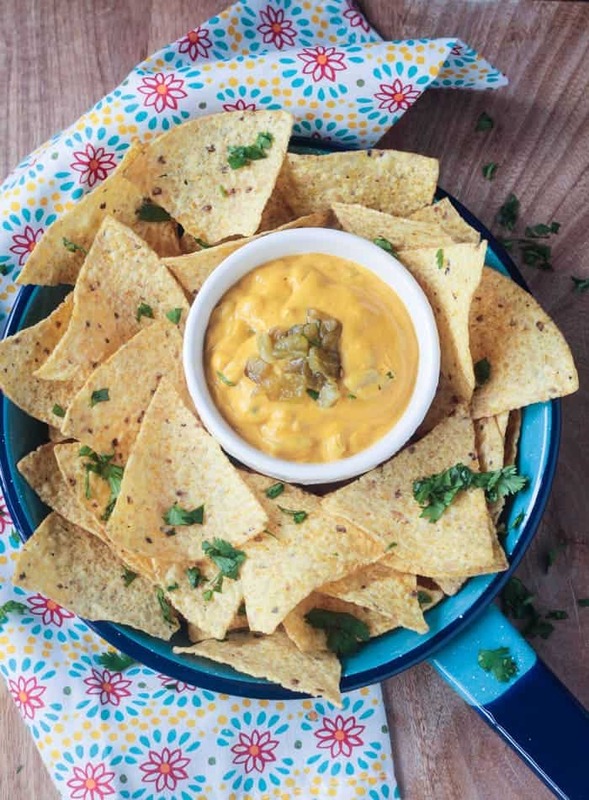 My kids love Chips and Dip, and these chips and dips are innovative. Thanks for sharing a nice idea! Thank you, Rukhsana! I hope you enjoy! 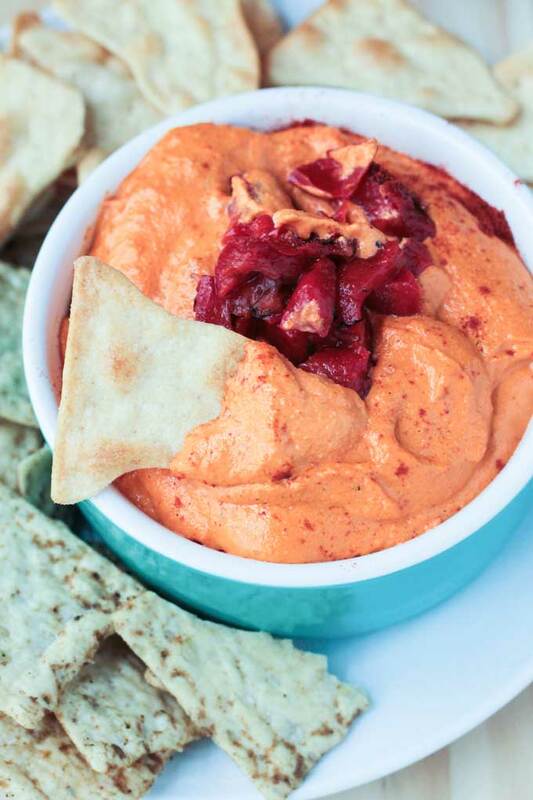 This dip looks so good, Jenn! I love that you used cashews! I think I’ll have to try that for New Year’s Eve!! 🙂 I actually thought about making hummus, but this sounds so delicious!! It’s a nice change from the standard hummus (though I do LOVE all kind of hummus!). Let me know if you try it! Thanks, Sina! Mmm, I’m all in for creamy cashew based dips 🙂 delicious! Dip should be a food group all on it’s own. 🙂 Thanks, Lucie! 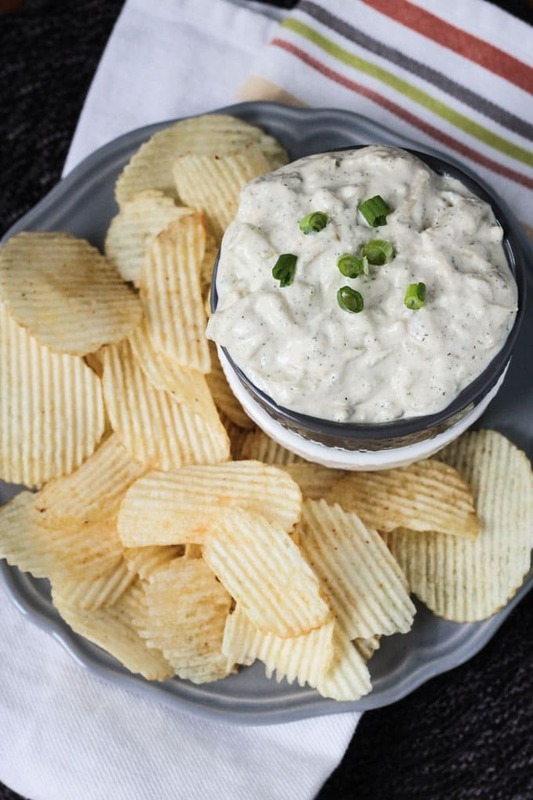 I’ve had an onion dip on my to do list forever because it used to be my favorite and this one looks just incredible! I can almost smell and taste it and the texture looks just perfect! It was such an addiction of mine in the past! I must say I’ve consumed way too many chips this week because of this dip, but at least the dip is a healthy version! 🙂 Thanks, Brandi! This looks great! I love that it’s cashew based. Cashews are one of those plant based miracles!! Thanks, Becky!